Students who sat last year’s O-level examinations set a new record, with 84.8 per cent of the cohort attaining five or more passes. 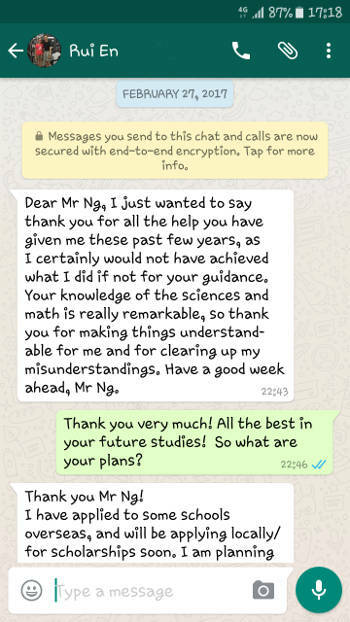 A notable achievement was made by former Hai Sing Catholic School student Ryan Lu, who did well at the O-level examinations despite having been diagnosed with hearing loss in both ears since birth. His results were good enough to earn him a place at Anglo-Chinese Junior College, according to his teacher, Mrs Wong Shu Xian. When he was preparing for the O levels, Ryan attended tuition classes for physics and mathematics. He is able to learn in a regular environment, though Hai Sing Catholic arranged for him to have fewer changes in teachers so he could get used to how they speak. Ryan has an interest in history and wants to be either a historian or a naval architect.